Narrow-Fruit Whitlow Grass is an annual or biennial herb, 10-20 cm tall, increasing up to 40 cm in fruits, often branched from below, leafy. Basal leaves are in a rosette, oblong-elliptic or oblong-obovate, 1.5-4 cm long, 5-15 mm broad, pointed, stalkless, somewhat toothed to entire. Stem leaves are few, usually 2-5, lanceshaped, 1-3-toothed, stalkless, pinted. All leaves are hairy with simple and branched hairs. Flowers are borne in 20-30-flowered, lax racemes, up to 20 cm long in fruit. 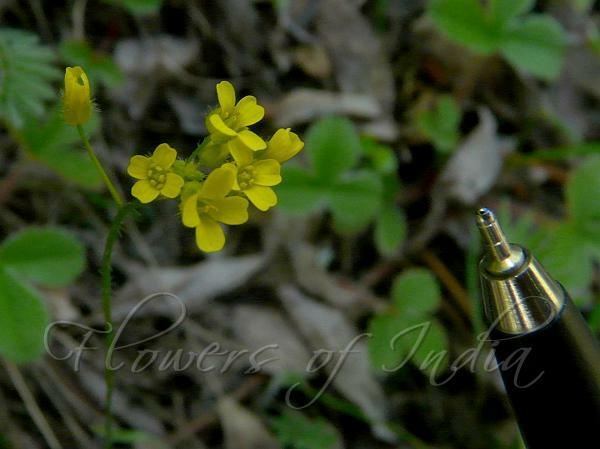 Flowers are 3.5 mm across, yellow or yellowish, often drying whitish. Flower-stalks are 8-15 mm long in fruit, spreading. Sepals are about 2 mm long. Petals 3-4 mm long, 1 mm broad. Stamens are abou 1.5-2 mm long. Fruits are linear-oblong, 1-2 cm long, about 2 mm broad, compressed, erect on spreading stalks, somewhat hairy or glabrous. Seeds are 14-20 in each locule, about 1 mm long, ovate, brown. 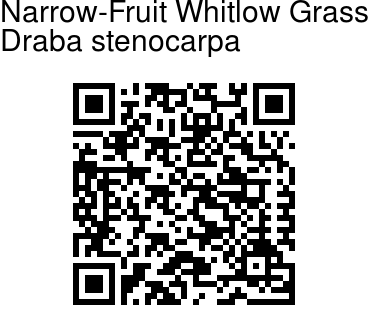 Narrow-Fruit Whitlow Grass is found in the Himalayas, at altitudes of 2500-5000 m. Flowering: June-August.